I get samples of products in the mail sometimes. Some I test out and forget. Others, I feel that I need to tell you about because they make me so incredibly happy. Here's how it went down. This company called Old School Favorites tells me they'd like to send me some of their products: either their "Szauce", described as "an indulgent gourmet chocolate sauce that's handmade using a blend of Hudson Valley Fresh Cream, North Fork sea salt, Madagascar vanilla, Valrhona cocoa and organic stone ground Taza Chocolate", or their "Nutsz", described as "premium quality California walnuts blanketed in a sweet shell made from the finest organic New York State maple syrup and a pinch of North Fork sea salt. " I probably responded with something like "sure, surprise me". 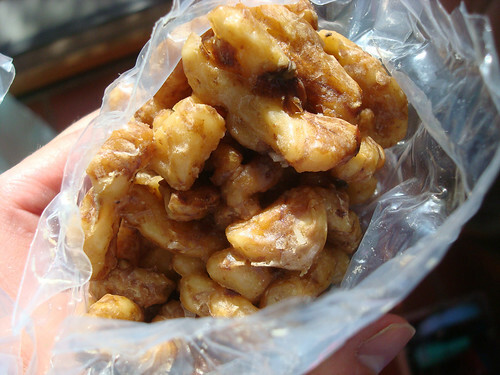 And a few weeks later, I received a vacuum-packed bag of nuts. I'm sorry--nutsz. I opened the pack and tested one out. Good golly, that tasted good. 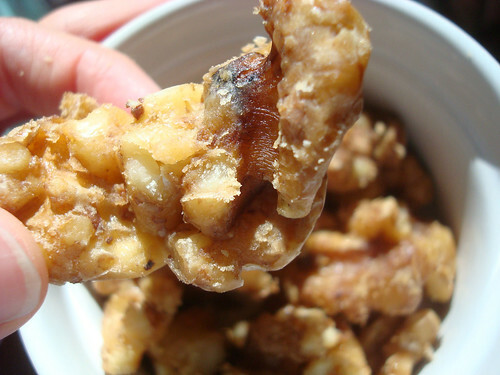 It was softer than most candied walnuts I've tried before, but not like, soggy soft. Maybe I'm not a candy purist, but I actually liked that it didn't threaten to tear the roof of my mouth or break my teeth. 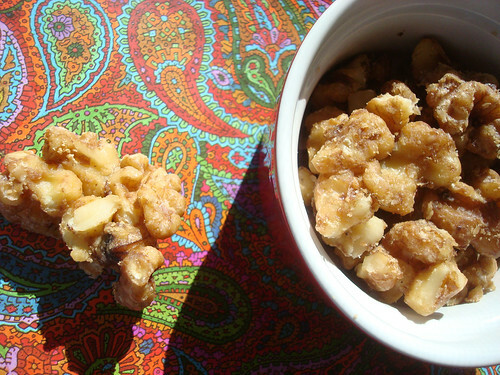 The maple flavor was a little different than what you'd expect in a candied nut--it made them a little more complex and cozy-tasting. I loved the salt--for me, something like maple syrup, which is so sweet, needs a little touch of salt to balance it out. I would have added it if they hadn't, so they saved me the trouble. Before the end of the day, I was basically using them on everything: atop ice cream, to make my Nanaimo bars even richer by serving them with a nut or three on the side as garnish, heck, even on a slice of toast with butter and a pinch of sea salt. In short: I was impressed. 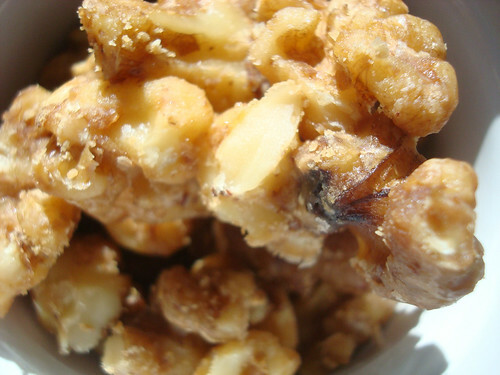 The nuts (sorry, nutsz) are not cheap at $12 plus shipping, but you need a treat every now and again, don't you? And in a world where lattes are regularly over $5 now (when did that happen, btw?) it's not so terrible. Buy online at the Old School Favorites website.